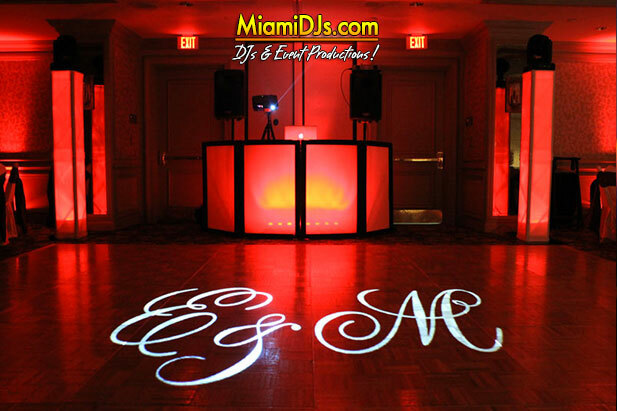 Miami DJs offers custom designed monograms that wil add a touch of personal customization to any event. Whether you would like initials, your name, date, words or even a corporate logo, we have a monogram that is right for you. Our monograms can be strategically placed on the dancefloor, on walls or on the ceiling to create a visual enhancement that will take your photography to another level. Imagine dancing your first dance with your names or initials on the dance floor. We also offer dynamic monograms, which include different designs and can be transitioned throughout the evening.